In the seventh century AD, the Chinese monk Xuanzang set off on an epic journey to India to study Buddhist philosophy from the Indian masters. 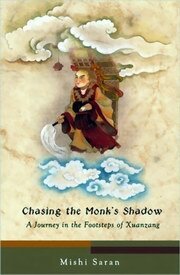 Traveling along the Silk Road, braving brigands and blizzards, Xuanzang finally reached India, where his spiritual quest took him to Buddhist holy places and monasteries throughout the subcontinent. Fourteen hundred years later, Mishi Saran follows in Xuanzang's footsteps to the fabled oasis cities of China and Central Asia, and the Buddhist sites and now-vanished kingdoms in India, Pakistan and Afghanistan that Xuanzang wrote about. Traveling seamlessly back and forth in time between the seventh century and the twenty-first, Saran uncovers the past with consummate skill even as she brings alive the present through her vivid and engaging descriptions of people and places. A riveting mix of lively reportage, high adventure, historical inquiry and personal memoir, this delightfully written book is a path-breaking travelogue.